Left to right: Sherry Foulger, Sales Director from Fine & Country, Francesca Taylor, Property Consultant from Fine & Country, Andrea Houghton, Manager from The Forge Project, Caz McCabe, Support Worker from The Forge Project, Paddy McArthur, service user from The Forge Project. The autumn 2018 grant programme was a huge success with more than £45,000 given to homeless causes. As part of our commitment to support these charities and show how every penny you donate makes a huge difference, we caught up with The Forge Project to update you on their progress. 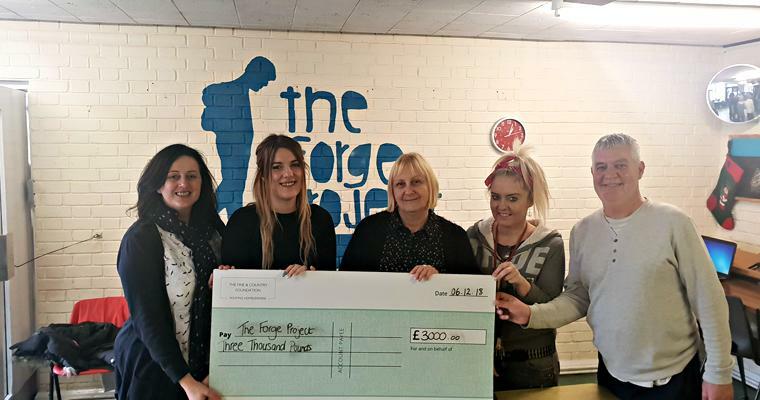 Fine & Country North Lincolnshire visited The Forge Project, their local homeless charity which received £3,000 for their winter provision project. The day centre works with homeless and vulnerable people, many of whom are suffering from mental and physical illness, addictions or are ex-offenders. Through a combination of immediate short-term support, such as the winter provisions above, and collaborative activities that target the root causes of issues, The Forge Project has made incredible progress in their community. Find out about the other charities to receive grants from our autumn programme here. To add to the Christmas spirit, the Fine & Country team collected a car-load of supplies for the Scunthorpe foodbank for our food parcel challenge to support the most vulnerable in their community. Fine & Country Northern Lincolnshire canvassed the streets of Brigg while their sister company, DDM Lettings, walked around Scunthorpe. Together, they collected trolleys full of essential items including: tinned meat, pasta, rice, hygiene products and more. The Fine & Country Northern Lincolnshire team will join The Fine & Country Foundation for the National Three Peaks Challenge on Saturday 22nd June. They will climb the highest mountains in Scotland, England and Wales: Ben Nevis, Scarfell Pike and Snowdon, respectively in 24 hours. Are you up for the challenge to support a homeless charity of your choice? Find out more here and register for FREE at foundation@fineandcountry.com. The next grant programme is open from 1st-31st March 2019. Registered homeless charities are invited to apply for up to £3,000 of funding during this time. For more information, click here.